Nerja is a popular coastal resort town some 50 kilometres east of Málaga city connected by the A-7 coastal highway, marking the eastern limit of the Málaga province. Once a small sleepy fishing village, it is now a popular wedding destination for those wanting a Spanish wedding with plenty of sun, breath-taking views and a taste of the real Spain. Its 16km of white powdery beaches and clear turquoise waters, a lot more dramatic and picturesque than its nearby more famous towns, guarantees you plenty of options when it comes to planning your big day in Nerja. Nerja is the unsung wedding destination of the Costa del Sol. Although many bridal couples flock to the west of Malaga for the glitter of Marbella, or the ‘pueblos blancos’ of Mijas and Benahavis, those in the know turn east to the stunning town of Nerja. Here are the top five reasons why a destination Spanish wedding in Nerja is what dreams are made of, and why your guests will be over the moon that you chose it! 1. It’s oh so pretty! Flanked by a dramatic mountain range, Sierra Almijara, the town has managed to avoid being blighted by concrete high-rise buildings – an inevitable result of the tourist boom found in many other coastal resorts. The old part of town has remained unchanged over time, with cobbled winding streets and whitewashed houses with wrought iron windows filled with geraniums and plants. 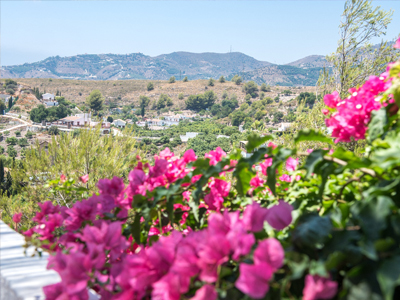 Coupled with the dramatic mountain range overlooking the quaint whitewashed town and its sandy beaches, you can’t pick a prettier or more relaxed Spanish wedding location. The heart of Nerja is also famous for its Balcón de Europa (the “Balcony of Europe”) – a magnificent promenade along the edge of a towering cliff, once the site of the great Moorish castle, with sweeping panoramic views of the Mediterranean and the small coves and beaches below. You can even visit the ancient caves nearby dating back tens of thousands of years! 2. You can marry in a church dating back to 1505! Have you ever dreamed of marrying in a typical Spanish church in the centre of a pretty whitewashed ‘pueblo’? El Salvador is Nerja’s most famous church. The original church was erected in 1505, although the existing structure was not built until 1697, and was further extended during the period of 1776 – 1792. On the front of the church are two large and typical ceramic tile plaques, one detailing the history of the church, the other a rather beautiful and colourful religious scene. The church is a charming mix of baroque and Moorish design and is popular with both local bridal couples and those marrying from abroad. The Sierras of Tejeda, Almijara and Almara were designated a natural park in 1999, this large and rugged mountainous region of 40,663ha stretches across the provincial border of Granada and Malaga. Its western part in Malaga province is known as the Axarquía and is famous for its attractive villages dating from Moorish times. Frigiliana is one such village. Wandering the tiny cobbled streets, it’s like stepping back in time to a land of Moorish Kingdoms and the Reconquista – a Moroccan-style village in the Spanish mountains. A trip to Nerja would not be complete without a visit to the caves, one of Spain’s most popular and spectacular historical sites. The magnificent Nerja Caves are a series of huge caverns stretching for almost five kilometres and home to the world’s largest stalagmite, a 32 metre high column measuring 13 metres by 7 metres at its base. You can also witness prehistoric cave paintings, although tourist access to these areas is limited to special groups. The caves were discovered in 1959 when five local lads from the village of Maro went bat-hunting and headed for a pothole known locally as ‘La Mina’. The boys returned the next day with tools to pick at some stalagtites in the entrance. Once inside, they found themselves able to descend to a huge cavern where they discovered a number of skeletons next to some ceramic pottery. The caves were officially opened to the public a year later, and now it’s a venue for concerts, guided walks, night tours and it even has a restaurant on-site. Beaches and water have always played a large part in Nerja’s history – with its name deriving from the Arabic word ‘narixa,’ meaning ‘bountiful spring.’ Some of the best beaches in the south of Spain can be found here. Burriana beach is Nerja’s most well-known beach. This long sandy beach offers water sports, restaurants and bars – perfect for families. Consistently voted as being one of the best beaches in Spain, Maro beach is a paradise. A land of hidden waterfalls, underwater caves and some of the best snorkelling around, all within a few kilometres from Nerja. Playa de Calahonda is the beach which most recognise from every postcard or Nerja-themed calendar. Restaurants and cafes look out over this beach but can get very crowded in high-season as it next to Nerja’s most famous feature – Balcón de Europa. All in all, Nerja offers not only a fantastic backdrop for your Spanish destination wedding, but also an unforgettable location for your wedding guests to enjoy a holiday of a lifetime. History, breath-taking scenery, sunshine, nature and plenty of Spanish culture awaits you and your loved ones as you build up to your special day. Contact one of Sunshine Weddings Spain’s agents to find out how we can plan your big day in Nerja – Spain’s hidden gem.